A new information about internal build 14927 leaked online. 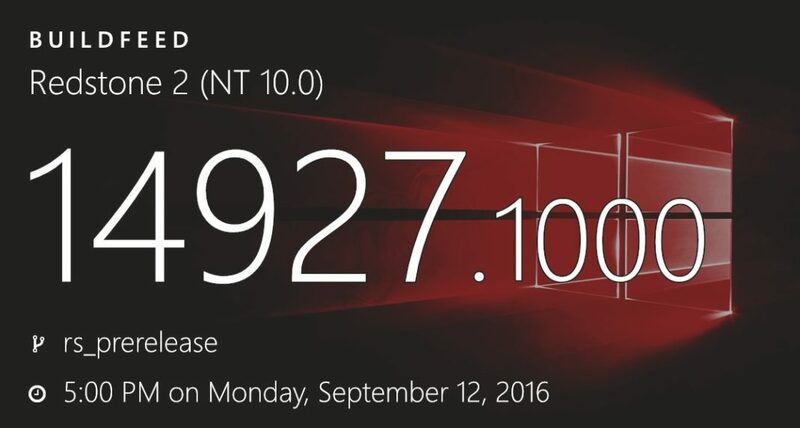 Windows 10 PC build 14927 and mobile build 10.0.14927.1000 is now under internal testing. The latest internal build is compiled on September 12, 2016. Microsoft may release new build today for fast ring insiders. There was no build release last week because of server update. We can expect Windows 10 Redstone 2 build 14921 to be released today or tomorrow for fast ring insider members. Recently, Microsoft had released last Windows 10 Redstone 2 PC build 14915 and first R2 mobile build 10.0.14915 for fast ring insiders. The company also released cumulative Update kb3189866 build 14393.187 for Windows 10 Anniversary Update users. Microsoft also released Xbox One Preview update for insider members.